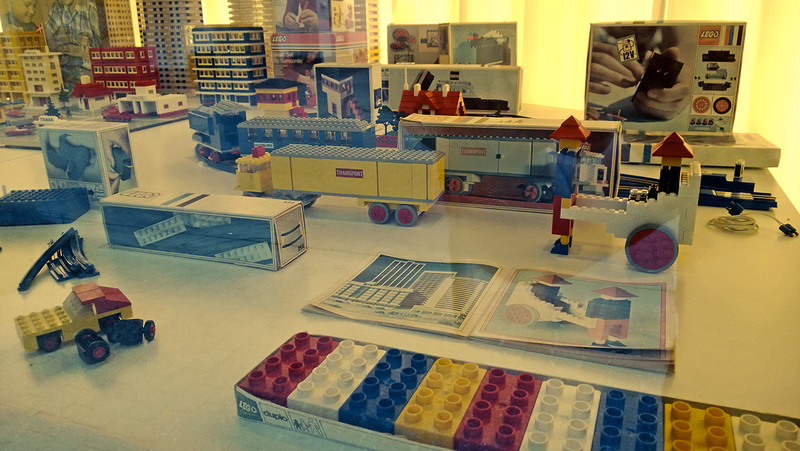 In the past I have written about my father’s old 1960s LEGO, I also posted some photographs from the Billund LEGO museum showing this era. Also related to this post I recently discussed the modern LEGO Power Functions electronics and the 1980s 12V LEGO Trains electronics on my Quest for Inter-City train series. 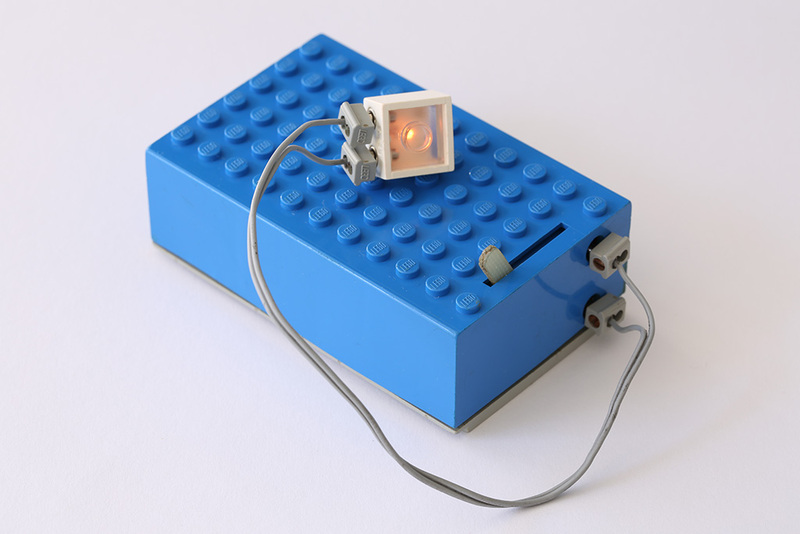 Here’s something that combines these topics: 1960s LEGO electrics. Back in the 1980s I had a grey, 1980s 4.5V LEGO battery box (something akin to the 1168 or 5005 Battery Box), which I used to operate the LEGO Technic motor. I also used it to light up the interior of my 7710 Push-along Passenger Steam Train, which I mentioned in a previous post. 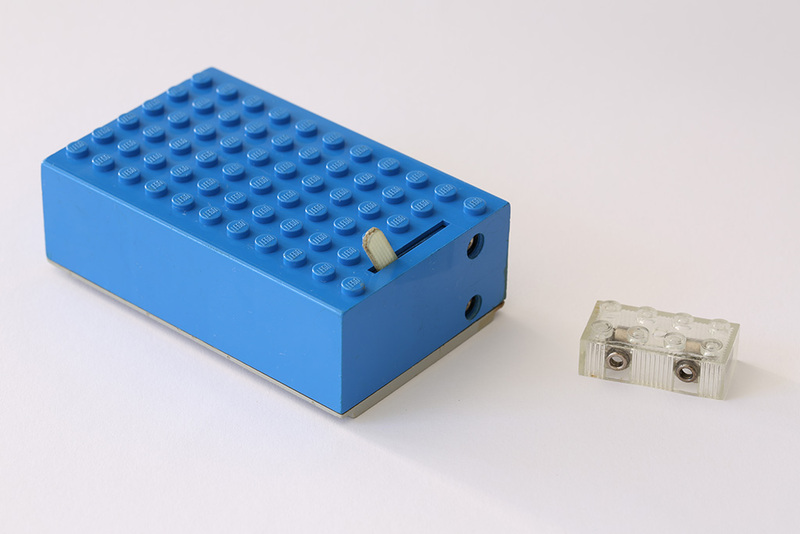 Going through my old LEGO collection, I found the actual light brick I used with that battery box: a 2×4 transparent illuminating light brick from circa 1966. Indeed, now I remember, I had used my father’s old lighting from the 1960s. It worked just fine with the 1980s battery box and cabling. Unfortunately last I saw that 1980s 4.5V LEGO battery box was some years ago as my son’s bath toy. Yes, really. It had lost its cover over the years and, if the rest still remains, is certainly in no shape to power anyone’s lights or motors anymore. Luckily, another piece I came across was my father’s old 1960s LEGO battery box, the original blue one (you know, from that era when everything we now expect to be grey was blue in LEGO). My father’s battery box is in fact the earliest one known, without a separate top lid, not the 1969 one shown in the Billund photo below. Researching 1960s LEGO – let alone 1950s – is a bit of a chore, because many of the sites I frequent understandably have limited information on them and inaccuracies mount the further back you go. Things aren’t helped by the fact that the U.S. market, through the Samsonite license, basically had a completely different assortment of early LEGO products. Peeron places this original battery box in 1966 and some Ebay entries I found also place the light brick in 1966, in the set 445 Illuminating Light Brick – released the year of the first LEGO Trains. The battery box appeared in a few sets, but the solo one was: 101 Battery Box. The year 1966 could be consistent with possibly some of the last LEGO sets before my father’s dark age. However, there was also a 245 Lightbrick from 1958, hitting my father’s main LEGO years more closely, in the early 1960s when LEGO came to Finland. One of the better early Internet sources is the timeline at Brick Fetish, which confirms the light brick was available at least in 1963 and thus, clearly before 1966. (Brick Fetish also has a history on LEGO Trains.) Brickset Forum has a great post on this too, which suggests the light brick came as early as late 1957. Finally, Brickipedia lists a 245 “Lighting Device Pack” from 1958. Clearly this 2×4 light brick spans from circa 1958 to somewhere towards the end of the 1960s. But how were its earlier iterations powered? Brick Fetish lists no power box in early catalog images, nor do the other sources mention such a box either, prior to 1966. Another problem is that, in some photos, the 101 Battery Box has a white or a even a blue bottom – my father’s old battery box has a grey one. On the other hand, the grey bottom does appear in some other photos floating around, so maybe just one of those variations depending on time and place… Then I started thinking, that old 4.5V battery has flat contacts, that you could split the connectors into. In fact, I remember doing so some three decades ago. Bang, memories. Maybe the wires were meant to connect directly to the battery… And so they did, as the original set 245 building instructions at ToysPeriod.com confirm. 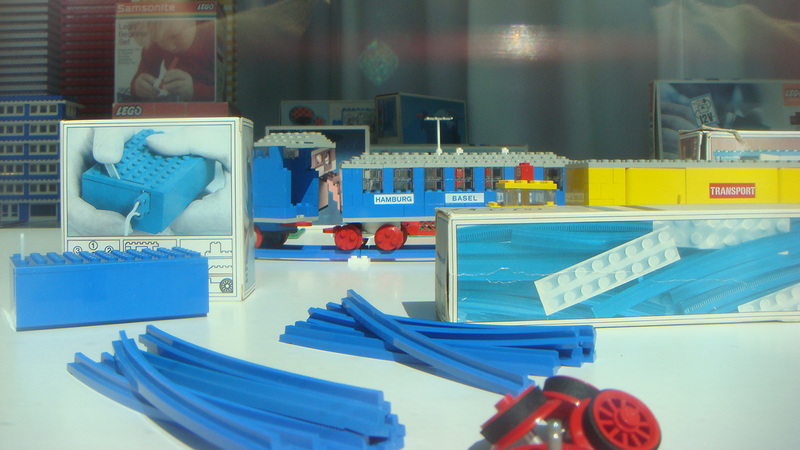 There was no LEGO battery box prior to 1966, you connected directly to the battery itself, until the development of the first LEGO Trains motor required a more integrated solution. So, indeed it seems the battery box is from around 1966, while the light brick may be from the same year or a few years older. I would wager both are from the 1960s at least, since LEGO was not released in Finland until then. 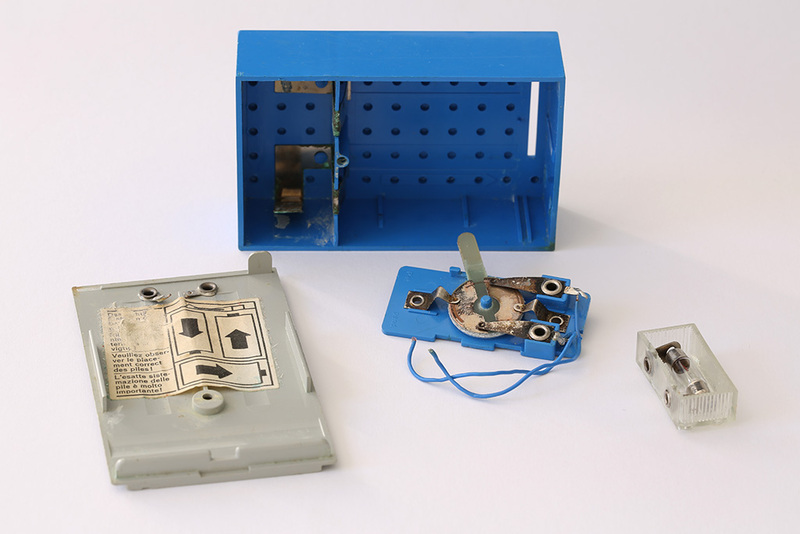 Unfortunately I’m not sure the blue battery box ever worked as a child – or if it did, only briefly. Its battery contacts have become quite oxidized, bottom connector wiring has disconnected (fortunately that secondary connector is not needed to operate the box) and one of the battery contacts inside has been partly broken off. The plastic itself is in fairly good condition, though, and most importantly the power lever and its main connector works. This looked like a challenge to me. In an earlier story I used kitchen tin-foil (or aluminium) to fix light-leaking LEGO Trains light prism holders. Now that same tin-foil would help me harness some 1960s power in 2013. I tucked in generous slices of tin-foil to repair/replace contacts where needed (the batteries will hold the tin-foil in place) and used a multi-meter to confirm the results. No other assembly required. The box is, after all, only meant to connect three 1.5V C batteries in series and switch on/off/reverse polarity. The old light brick light has burnt out, but connecting a 1980s 12V light brick confirms power is flowing, albeit of course insufficiently to run the 12V light at full power – the battery box is just 4.5V after all. By the way, the light bulb in the old 1960s light brick is easily replaced as it simply plops out when pulled/twisted. If a replacement can be sourced, that is. Looks like a pretty standard S5.5 toy/automotive festoon bulb (markings W.S. 4.5V), 24 mm long tip to tip – little over three studs. I wouldn’t be surprised if a fitting LED variant could be found these days. See Liteup Blocks, reviewed on BrickNerd, for a modern third-party option. P.S. I came across a wonderful LEGO Town Plan commercial from 1958: Wir bauen eine Stadt (We build a city). See also a LEGO by Samsonite advertisement from the U.S.
he, I have plenty of those Lego-parts you might be interested of; Windows, Garage parts, Battery box, 1960-cars etc. I believe I have found 2 of these battery boxes and 2 motorized blocks in blocks I have had for years. I also found some old train cars, blue rails and electric cords. I inherited them all from my uncle who was born around 1958. I had them for years. I would like them to go to a collector who would appreciate them more than me. I’ve been building sets since the 80 so they are of no use to me. Hello i think i have a similar power box to the one you have pictured it was gifted to me years ago from some friends, It also came with a motor but no connector lead,my 8 yo son really wants to get this thing paired up can you recommend what would be best to use as a substitute.